Leading Manufacturer of vacuum pump for solvent recovery, crystallizer, vacuum pump for solvent extraction and vacuum pump for solvent recovery from Ahmedabad. Single Stage Vacuum Pump for Solvent Recovery, Crystallizer are equivalent to most reliable SLM-MANEKLAL design. These rugged pumps are simple for smooth operations and easy to maintenance. Single Stage Vacuum Pump for Solvent Extraction are equivalent to most reliable SLM-MANEKLAL design. These rugged pumps are simple for smooth operations and easy for maintenance. 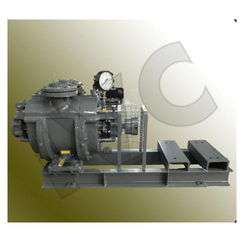 These Vacuum Pump for Solvent Recovery are of oil-immersed, rotary vane type pumps. The rotor, with two spring loaded vanes, is mounted eccentric in the stator body/casing. As the rotor, rotates the vanes sweep the crescent shape air space twice in each revolution. Manufactured from graded material, all moving parts are precisely machined, ground and assembled with close tolerances. This results in increased efficiency and long trouble free operating life and it create high vacuum. Looking for Vacuum Pump for Solvent Recovery, Crystallizer ?